I’m the only one in the house who likes an apple crisp (no sharing! Score! ), so I cut up two granny smith apples and tossed them in lemon juice so they wouldn’t brown (that’s two fruits already; this is practically a salad). Then I sprinkled in brown sugar (about 1/3 cup) and generous sprinkles of cinnamon and nutmeg, and stirred till the apples were all coated in sugary goodness. I melted butter in the bottom of a little baking dish and spread it out with a brush, then dumped in the coated apples. In a new bowl I put about a 1/2 cup each of white flour, white sugar, and oats. I cut in about 3-4 Tbsp of butter and a pinch of salt, and sprinkled that over the apple mixture. 25 minutes in a 350 toaster oven = happy mama. 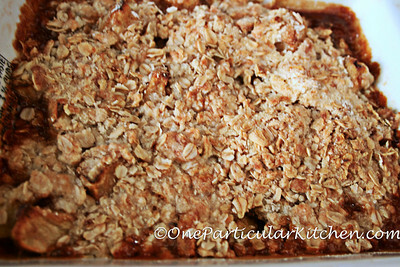 Apple crisp for breakfast anyone?